Ask about our special opening night VIP tickets and get a chance to visit with the authors! 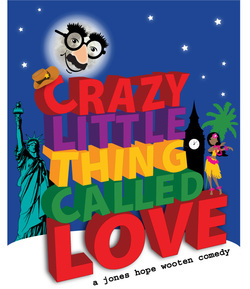 You are cordially invited to the World Premiere Opening Night on October 11th, 2013, of Crazy Little Thing Called Love. 5:30 pm - 6 :15 pm Pre "Glow" in the Library with the playwrights (see below), cast and crew. Punch and light hors d'oeuvres. Photo ops. 7:30 pm - Prepare to laugh and enjoy the "Show"
10:00 pm - After "Glow" reception at Houlihan's in the Lansing Mall. Question and Answer period with playwrights, cast and crew, drawing for free tickets, photo ops, hors d'oeuvres & one house beer/wine ticket. Includes the above and a signed program by the authors. For VIP tickets, contact our office at (517) 243-6040. Discount available for Punch Pass holders. ABOUT THE AUTHORS: All five of the shows Starlight produced written by Jessie Jones, Nicholas Hope and Jamie Wooten were great successes: Dearly Beloved, Christmas Belles, Southern Hospitality, The Hallelujah Girls and The Red Velvet Cake War. Jessie Jones co-authored the Off-Broadway Southern-fried funeral comedy, Dearly Departed, which has become a perennial theatre favorite across the US and around the world. She also co-wrote its hit feature film adaptation, Kingdom Come, which was released by Fox Searchlight Films and starred LL Cool J and Academy Award winner Whoopi Goldberg. Jessie is one of the most produced female playwrights in America today. Nicholas Hope, winner of the Texas New Playwrights' Award, was Director of Casting for Theatre Communications Group in NY, The Goodman Theatre in Chicago and ABC Television in NY and Los Angeles. With Jessie Jones, he wrote for the Emmy-winning Disney television series Teacher's Pet, starring Tony Award winner, Nathan Lane. Together with Jessie Jones and Jamie Wooten, Nicholas wrote for USA, WB, UPN, SYFY, Nickelodeon and Fox. Jamie Wooten was a writer and producer for many seasons of the television series The Golden Girls, where he won the Writers Guild of America award. He co-created the CBS series, The Five Mrs. Buchanans, starring Oscar winner Eileen Heckart and Tony winners Judith Ivey and Harriet Harris. He was the executive producer of the Fox comedy, The Crew, NBC's For Your Love and UPN's Half & Half. A Billboard Award-winning songwriter, Jamie has written tunes for television and film. "Love Is On The Air"
"The Lone Star Ladies Justice League"
"A Little Brit of Romance"
"A Hono-lulu of a Honeymoon"